The 119cc Evans Power-Cycle was manufactured by the CycleMotor Corporation between 1919 and 1924, both as a complete machine and as a separate cycle-attachment engine. Various Evans motorcycles were exported to Europe. 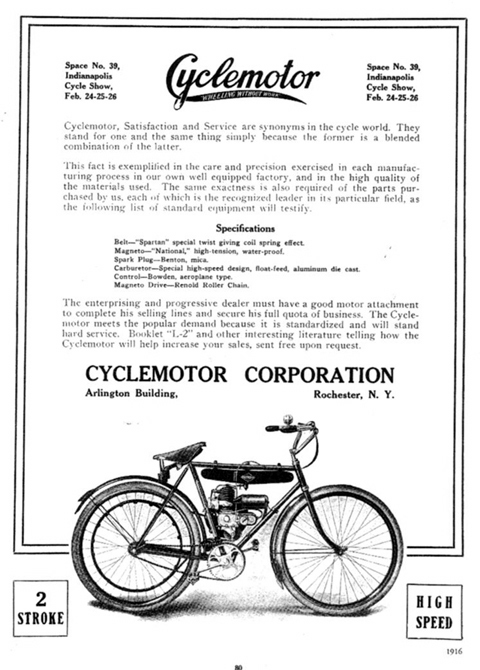 As you can see from the brochure reproduced above, the Cyclemotor Corporation supplied this engine and petrol tank as a kit to fit to your own bicycle. 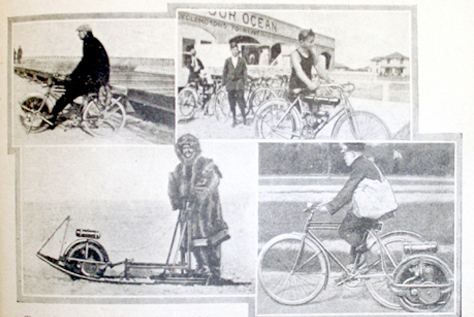 Motorcycles were still very basic at this time, and cycle-attachments such as this were popular options. This example is an original Evans bicycle and engine. The Evans was marketed in Great Britain too. By the mid-twenties, however, motorcycle design had improved and prices had been greatly reduced for lightweight motorcycles; even small cars were now sold for under £100. As their production costs were high, cyclemotor manufacturers could not compete, and the era of cyclemotors and cycle-attachments came to an end (just as it did in 1955 with the introduction of the first mopeds). Below: an Evans pictured at the beach in a period magazine.